HARARE, Zimbabwe (CNN) -- Some of Zimbabwe's children are "wasting away" as political turmoil and economic crisis have caused a severe food shortage, according to a report from Save the Children. 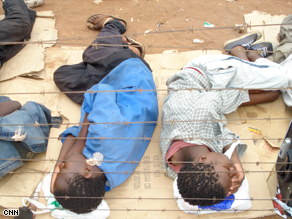 Children sleep in rough conditions on the border between Zimbabwe and South Africa. The number of acute child malnutrition cases has risen by almost two-thirds in the past year, the report from the UK-based agency said in its appeal to world donors for help. "There is no excuse for failing to provide this food," program director Lynn Walker said. "The innocent people of Zimbabwe should not be made to suffer for a political situation that is out of their control." Five million Zimbabweans -- out of a population of about 12 million -- are in need of food aid now, the report said. The group is appealing for 18,000 tons of food for next month. "We have already been forced to reduce the rations of emergency food we are delivering because there isn't enough to go around," the report said. "If, as we fear, the food aid pipeline into Zimbabwe begins to fail in the new year the millions of people who rely on emergency food aid will suffer." Zimbabwe is facing its worst economic and humanitarian crisis since its independence from Great Britain 28 years ago. There is an acute shortage of all essentials such as cash, fuel, medical drugs, electricity and food. President Robert Mugabe blames the crisis on the sanctions imposed on him and his cronies by the West for allegedly disregarding human rights. But Mugabe's critics attribute the crisis to his economic policies. As the economy has faltered for almost a decade now, a cholera epidemic is raging, fueled by the collapse of health, sanitation and water services in Zimbabwe. The epidemic has claimed more than 1,100 lives and infected more than 20,000 people since its outbreak in August. Health experts have warned that the water-borne disease could infect more than 60,000 unless its spread is halted. The political crisis rose to a boil in this year when the opposition party claimed that it won the presidential election, but Mugabe's government refused to recognize the result. Instead, the race was thrown to a runoff, which was boycotted by the opposition. Mugabe signed an agreement with the opposition in September to form a unity government, but a bitter dispute over the division of cabinet seats has prevented its formation. Inflation is so severe that the government was forced to print $10 billion currency notes last week, with each expected to buy just 20 loaves of bread.